With all the new smartphones coming out, it’s really hard to pick one that will satisfy all of your requirements. Think that the Samsung Galaxy Note 2 is too big but the iPhone 5’s too small? Then why not pick a phone with dimensions that fall right in the middle? Check out the HTC One XC. The HTC One XC was unveiled last Friday at a telecommunications event in China. According to reports, the HTC One XC is specifically designed to go up against the new generation of Android smartphones such as the LG Optimus Gbut has features that can possibly let it hold its own against giants like the Samsung Galaxy Note 2 and the iPhone 5. The HTC One XC appears to be an upgrade of the Taiwanese company’s flagship Android smartphone, the HTC One X. The biggest difference between the two is that the HTC One XC is rumored to be packing a monstrous 1.5 GHz quad-core processor. HTC One X owners should be familiar with the other specs — 1 GB RAM, a generous 4.7 inch display with a 1280 x 720 resolution and an 8 MP camera. The HTC One XC sports a black body with chic gold trim, a look that allows the smartphone to differentiate it further from the HTC One X. Pricing and release date details are yet to be released as of the moment but we’ll be sure to report them as soon as they’re available. 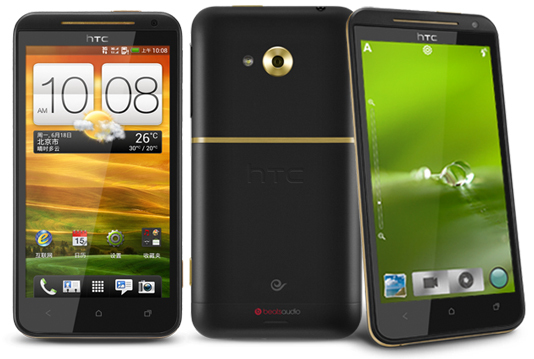 Do you think the HTC One XC would be a good alternative to the Samsung Galaxy Note 2 or the iPhone 5? HTC One X owners, would you want to upgrade to this phone? Share your thoughts in the comments below!